The new Qnique 14+ Quilting Frame is designed specifically to accommodate the Qnique Quilting Machine. Get both the frame and the machine together in this amazing combo for the ultimate quilting experience! There is also a Stitch-Regulation upgrade available for all 15M machines, in case a customer wants to later upgrade their manual speed machine to be stitch-regulated. *Synchrony 18 Months No Interest Financing for Equal Monthly Pay plus any applicable taxes. Transaction Code 418. Apply online. GE will advise you of your maximum amount or full credit that you can use towards purchase. Interest Free Financing Orders must be called into 800-739-7374 after Synchrony approval. The Qnique 14+ Quilting Frame is designed specifically for the Qnique Quilting Machine. The frame utilizes cast-alloy components, which make it stronger and lighter than previous frames. Standard Height-adjustable legs let you adjust the level of the frame, so that quilting is more comfortable and less awkward. New to quilting machine reviews, the top of the line quilting machine is the Grace Company's Qnique Quilter quilting machine. With this machine being the most economical model out there and the best performance for the buck, this machine is awesome. The company that makes this machine, The Grace Company, has been in business for 25 years and leads the industry in quilting machines and accessories. This machine takes the features of the the long-arm machine and combines it with the size and price of a mid-arm quilting machine. The Grace Company's Qnique quilting machine has state of the art sewing technology along with a high grade aluminum body that has everything you need at the touch of a button. It has been built to make even the most difficult of quilts easy to make whether you are an experienced quilter or are just getting started. It doesn’t get any better or easier than this. This state of the are machine makes the very best of quilts out there. This machine has a state-of-the-art bobbin system with a bobbin winder that is built into the machine. It has high speed that works automatically as you need it. When you need to refill the bobbin, you just use one of the threads from the tower and it winds itself. It turns on automatically and turns itself off when you are done. This machine also has an easy-access bobbin case that just pops open and makes it easy when you need to change or adjust your bobbin. The bobbin is larger than the usual size on most machines, so that you can quilt longer without stopping. You now have more control of your work space with six buttons on the handle to work with, to make things faster and easier. This machine also comes with its own regulation of stitches that is built into the machine as part of how it runs and has a hand dual thread tensioner to help when quilting. It has 6 LED lights that light up your needle area for easy visualization of your work space and the stitching that you are doing. It has two thread holders with the fastest sewing speed possible of 1800 stitches per minute. This machine is made to make the biggest and thickest of quilts and makes sewing faster than any other machine. The Grace Qnique sews seven to fifteen stitches per inch when stitching. It even has three different stitch regulators to make sure your stitches are even and consistent. You also have a manual speed control to be able to control the speed of the stitching yourself. If you get to stitching too quickly, there is a warning that tells you that you are stitching too fast for what you are stitching. This quilting machine comes with large throat space that has the most room for the largest and highest quilting material for stitching on the market today. This makes quilting so much fun to do at home and it couldn't be easier. Did you know that the optional Qnique Laser Stylus accessory can be easily attached to the machine to help you trace patterns or pictures while you are quilting on a quilting frame? You have the choice of attaching the laser to the front or rear handles, or even to the bottom of the machine, between the wheels. The easiest way to trace a pattern when you are quilting is to use the Qnique Laser Stylus. Using this accessory, you can just put the pattern you wish to trace to the side and trace it with the laser as you quilt. The Laser stylus plugs right into the Qnique’s accessory port for power, so you do not have to buy any batteries. The laser is designed to be versatile and can work while attached to the front or rear handles. It will also work near the bottom of the quilting machine. You can angle the laser in any direction, the way you want it to work. The Grace Qnique Quilting Machine is made with quality and performance and cost in mind. These machines are industrial strength and have industrial strength performance. They make the making of quilts so easy, even a beginner could get started right away. This really is the best quilting machine out there for the money. The Grace Qnique Machine includes several accessories such as the lubricating oil to keep it running smoothly and correctly, quilting needles to sew with, and bobbins to use to help make those gorgeous quilts. Quilters are a great group of quilters who recommend this machine with an 89 percent rating. There are also a lot of blogs, and websites like (www.quiltingindustry.com) where you can get information on the newest accessories, quilting clubs, news, and see what all the other quilters are making. You will find out about their newest tricks, the newest on material, what is selling, and reviews, tutorials, classes and all about when the next quilting shows are. This machine only uses 300 watts of maximum power and its LCD light automatically shuts off after 15 minutes if not in use. It even has four plugins; for use of other quilting machine accessories that you might want to use. The Grace Qnique works easily with any frames that you might be already using. There are also many frames designed that are available to work specifically with this machine such as the SR-2 Quilting Frame and the Qnique 14+ Quilting Frame. The 14+ is a king size frame which handle the larger quilts. The extended length and height of the work area on the Qnique quilting machine gives you the freedom to quilt larger patterns or blocks. The Qnique features a 15 inch throat space from the needle to the back of the work area. With stitch regulation, increased stitch speed, extended throat space, advanced control settings, and so much more; the Q'nique long arm quilting machine is truly the most economical long arm quilting machine on the market! The Q'nique long arm quilting machine was designed to be as user friendly as possible. All of the main controls and settings can be adjusted and controlled from the handles and seen on the full-color display on the front of the machine. There is no need to reach around the machine to adjust the hand-wheel, with a push of a button you can raise or lower the needle. By holding the button you can even set a "needle stop position" that will return the needle to that spot when you stop quilting. The buttons on the handle bars allow you to adjust the speed of your stitching faster or slower. These same buttons control your stitch length when in stitch regulation mode. The regulation will adjust the speed for a consistent stitch after you set the stitches per inch. Your most important settings and quilt functions can be found right on the front LCD display. This means quick access to needle position, stitching mode, stitch speed, or stitch length. With four different stitch modes, the Q'nique is just as powerful as a high end long arm quilting machine but at a fraction of the cost. The stitch regulation knows when you speed up and slow down, and will adjust the speed of the stitch according to your movements for a clean and consistent stitch everytime! The stitch regulation can handle the full power of the Q'nique, stitching 1800 stitches per minute! In Precise Mode you control the "stitch per inch" setting for consistently sized stitches. Stitch regulation adjusts the stitch speed as you quilt faster or slower. Precise Mode stops stitching when you stop moving the machine. In "Cruise" mode, you set the SPI as well as a minimum stitch speed. Regulation adjusts to keep stitches consistent, but whenever you stop or slow your movements, the machine will continue to stitch at the minimum set speed. Baste mode is perfect for when you want to do some long basting stitches on the edges of your quilt. You can set the the basting stitch length to short, medium or long. Manual mode lets you control the stitch speed of the quilting machine. With the touch of a button on the handle bars, you can increase or decrease the constant speed. This is great for detailed or intricate stitching. Continuum Frame Assembly. Steps to assemble the Continuum Frame from The Grace Company. The Grace Q'nique 14+ Long Arm Quilting Machine will take your quilting to a whole new level. With a 15 inch throat space theGrace Q'nique 14+ Long Arm Quilting Machine gives you the freedom to quilt larger patterns or quilt blocks. TheGrace Q'nique 14+ Long Arm Quilting Machine includes stitch regulation, extended throat space, advanced control setting, easy grip handles, and increased stitch speed. The Grace Q'nique 14+ Long Arm Quilting Machine is brought to your by the Grace Company, which had been manufacturing and distributing quilting frames and accessories for over 25 years. Built In stitch regulation- THe Qnique uses high resolution encoders to keep your stitch length consistent. As you speed up or slow down, so will your stitch speed. Cruise Mode - Adds the ability to set a minimum speed with will maintain even if the operator releases the controls. Manual Mode - Allows control of the stitching speed. Qnique Quilter features video. The Q’nique Quilter 14+ quilting machine is a bold new breakthrough into the mid-arm category. 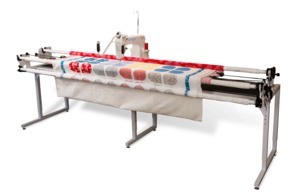 Brought to you by the Grace Company, an industry leader in frames and accessories, the Q’nique Quilter combines the features of a long-arm machine with the size and affordability of a mid-arm. This new affordable mid-arm quilter is loaded with professional features normally reserved for more expensive quilting machines. I've just moved the Grace Qnique 14+ to a Continuum quilting frame! Check out the timelapse video of how this changed my sewing room and how this style of longarm quilting works. Built in stitch regulation keeps your stitch length consistent, even as you speed up and slow down. The Qnique quilting machine features four different sewing modes, all conveniently displayed on the easy to navigate menu in he OLED screen.